← Where Oh Where Has ACORN Gone? Have the Nuts Multiplied? This week marks the start of the Republican National Convention in Tampa. 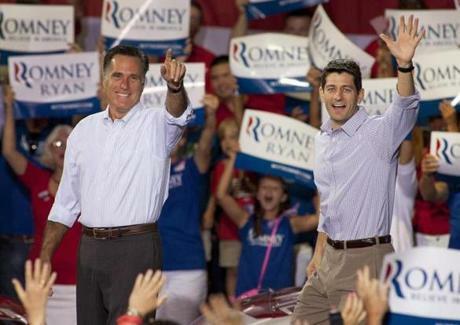 Mitt Romney and Paul Ryan will be named the GOP ticket for November’s election. We already know that Barack Obama and Joe Biden will be the Democratic ticket. So now we know who the candidates and personalities will be. The big question is what the election itself will be about. We know the bottom line. The election of 2012 will determine the type of country we wish to be going forward. It’s a moral question, and one that must be decided by a country that is steadily and quickly losing its morality. The moral question is whether we should have more spending and bigger government with less liberty or less spending with a smaller government and more liberty. Do we continue with a mindset towards individual liberty or with a mindset that government’s role includes taking care of people cradle to grave and stimulating and controlling the economy. Entitlements entitle the government to bargain away human liberty and stimulus money only stimulates one thing – the size, scope, and power of government. In the movie “The Pride of the Yankees,” Lou Gehrig’s mother is disappointed when she finds out her son has given up plans to finish college and become an engineer. She tells him: “In America, you can be anything. We didn’t come here from Italy for you to play ball.” (She didn’t understand that professional baseball players make a lot of money). Her point was that the decision of foreigners back in the early-mid 20th century to leave their homes, their countries, and their families was one that was balanced by the enormous opportunity to become personally successful in America. The ambition of our forefathers and our immigrant ancestors has been dulled by the entitlement mentality and the eagerness of our government to put everyone on some kind of government program, making them dependent on the government and on the Democratic party as well. In a sense, we are talking about national redemption. Political redemption. We need to talk about spiritual redemption as well, but that’s a topic for another day. This November, we need the GOP to put forth a plan for the redemption of our country. We need the Romney and Ryan to outline a plan that will recover the country from a mortgaged future that will bind and saddle our children and grandchildren. The government is financing its programs by deficit spending – that is, borrowing now and taxing later. In other words, Congress and the President are forcing future generations to pay for our problems, for problems we generated. We are shifting the costs of this massive spending scheme to our children. We are mortgaging their future. Every dollar the government spends, even if borrowed, has to come out of someone’ pocket and therefore preempts the use of that dollar somewhere else in the economy, both now and in the future. The CBO report affirms that the massive health-care overhaul fails to address the explosion in health care costs. Mandatory federal spending on health care will increase by 93% from 5.4% of GDP today to 10.4% of GDP over the next 25 years. The CBO projects that government spending as a share of the economy will increase by nearly 53% between now and 2037, up from its historical average of roughly 20%. Taxes are projected to rise to the historical average in the years ahead, yet the unprecedented growth in government spending is projected to rise much faster, driving an unsustainable explosion in debt. The long-term budget outlook continues to worsen with each passing year Congress fails to act. While total debt has already eclipsed the size of the entire US economy, debt held by the public is on pace to eclipse the economy shortly after 2022. The crushing burden of debt is driven primarily by the nation’s largest entitlement programs – Social Security, Medicare, and Medicaid – along with the compounding growth in interest payments on the debt. Government spending on health care entitlements, Social Security, and interest on the national debt will consume 100% of total revenues by 2025. According to the CBO report, the federal government’s interest payments alone are projected to consume 9.5% of our entire economy by 2037, up from about 1.4% today. So today, August 27, the Republican National Convention opened in Tampa, Florida. Americans will soon get a sense of what the dynamics will be for the election season. And of course, we will find out who the major players will be. Conservatives want to know if they have a ticket that can beat Obama. They want to know if the message will resonate with conservatives and especially independents. They want to know if their ideas will offer a suitable alternative to those disillusioned with the failed policies of the Democrats. Tea Partiers want to know what the dialogue will be on Constitutional governance, reducing the size of government, restoring fiscal conservatism, cutting back on regulations and promoting free markets, and emphasizing personal responsibility. But there is a slight problem. Tropical storm Isaac has made an unwelcomed visit to the coast of Florida and it’s likely to rain on the RNC’s parade (or convention). So where do we stand at this time? We are headed for a cliff. Since January 2009, Obama’s policies have increased our national debt by over 45%. We are headed for a recession if things don’t change. That recession could hit as early as beginning of next year. We are heading towards bankruptcy. Social programs make up most of our debt and Obama is increasing dependence on government. Obamacare is looming and in fact, provisions are already being implemented. It will present the largest middle class tax hike in history, they say. 70% of businesses say they cannot hire new employees or expand because of this healthcare bill. Obama is turning the full force of Homeland Security, the Justice Department, the State Department, and the Department of Defense inwards on American citizens. Despite the politics of oppression, Obama is still leading in national polls for the presidential election. An average of all the national polls shows Obama leading by 1.2% (as of August 27). Rasmussen, the most consistently reliable national poll, shows Obama ahead by 3%. A breakdown of blue states vs. red states gives an electoral college standing of 221 electoral votes for Obama and 181 electoral votes for Romney. Either Way – CO (9), FL (29), IA (6), MI (16), MO (10), NV (6), NH (4), NC (15), OH (18), VA (13), WI (10). There are 11 states – swing states or battleground states – that will determine this election and determine the course of our country for the next 4 years. Those states are Colorado, Florida, Iowa, Michigan, Missouri, New Hampshire, Nevada, North Carolina, Ohio, Virginia, and Wisconsin. Last week, Real Clear Politics announced that Obama has lost his lead in all of those swing states, except NH. The greatest movement was in Colorado, Ohio, and Wisconsin. Last week Obama was leading in Florida by only 1% and only slightly higher in Ohio. Today’s Real Clear Politics shows Romney and Obama in a tie now in both those battleground states. In Missouri, Romney is leading now by 4.3% and in North Carolina, he is leading by 1%. The question is whether Paul Ryan’s home state of Wisconsin will vote for the GOP ticket. Currently Obama is still leading by 1.4%. It is worth noting that in these swing states, the two most important issues are the economy and Obamacare. According to polling data, in Wisconsin, Ohio, and Florida, voters who strongly disapprove of the healthcare bill greatly outnumber those who approve of the bill. So healthcare is a big issue. In Florida, this is countered by the concern for Medicare. Remember the liberal superPAC ad that shows Ryan throwing grandma off the cliff. Romney and Ryan still have to clear the record on the Medicare issue. Once the facts are made known, Florida should go to Romney. What are the facts? — Who is the candidate putting Medicare at risk? Obama took $760 billion out of Medicare to help fund Obamacare. — Ryan seeks to secure and save Medicare, not destroy it. For those seniors 55 and older, there is no change in the program with his plan. Nothing changes for them. They have nothing to worry about. Those who are 54 and younger, starting in 2023, they will receive a fixed amount of money from the government to pick either private health insurance or a federal plan modeled on Medicare. Ryan says that will keep the program solvent. As you probably already know, Ryan’s plan first and foremost calls for the repeal of Obamacare. Second, it puts more emphasis on managing disease and treating health issues rather than wellness, unlike what Obamacare does. And that is the status of the race – red vs. blue – going into the Republican National Convention. The question on everyone’s mind is whether Romney and Ryan unveil a winning strategy in Tampa? We already know that Romney is committed to getting our finances in order. He intends to turn this country around, just as he did for the Olympics in 2002 when he served as president and CEO of the Olympics Organizing Committee. To show that commitment, he selected as his running mate a member of the US House who has served for 14 years, was elected by a traditionally democratic state, serves on the House Budget Committee, has a firm grasp of economics and numbers, and is the only member of Congress to come up with a budget plan to meaningfully address the national debt and put our country back on the path of prosperity. The budget plan he proposed in 2011 was passed by the House but rejected by the Senate. The budget plan he proposed this year – The 2013 Path to Prosperity– was overwhelmingly passed by the House. What a stark contrast Congressman Paul Ryan is to then-Senator Barack Obama. Ryan is a thinker with the discipline and courage to propose bold solutions to real problems. He is not afraid to talk straight with the American people about their shared interest in the economy. Obama can’t even articulate what “Hope and Change” means. All he can do is use his ethnic appeal to accuse wealthier Americans of not “doing enough,” while telling dependent Americans he will give them more. The Path to Prosperity is a blueprint for American renewal. It will cut more than $5 trillion in spending from the President’s budget over the next 10 years, will put the nation on a path to pay off our national debt, offers pro-growth reforms to our broken and burdensome tax code, saves and strengthens the social safety net, and will balance the budget in 20 years. Ryan’s budget plan sets forth a model of government guided by the timeless principles of our great American experiment: free enterprise and economic liberty; limited government and spending restraint; traditional family and community values; and a strong national defense. While it’s true that our government has strayed from these timeless principles, Ryan’s plan budget offers a set of fundamental reforms that will restore those principles and put the nation back on the right track. (1). Repeal of Obamacare. Ryan’s plan calls for the repeal of Obamacare. (2). Change Washington’s Culture of Spending. Ryan’s budget plan offers responsible spending cuts now and structural reforms of government spending programs going forward, to ensure that government spending remains on a sustainable path. Under this budget, government spending will fall from its current elevated level of 24% of the economy to below 20% by 2015. Relative to the President’s budget, this budget cuts spending by more than $5 trillion over the next ten years, producing $3 trillion in lower deficits. By restoring discipline to Congressional spending, this budget also tackles the drivers of our debt and averts the fiscal crisis ahead – by cutting debt as a share of the economy by roughly 15% over the next decade. (3). Strengthening Health and Retirement Security. Ryan’s budget puts an end to empty promises from Washington, offering instead real security through reasonable reforms. Medicare is facing an unprecedented fiscal challenge. Its failed reliance on bureaucratic price controls, combined with rising health care costs, is jeopardizing seniors’ access to critical care and threatening to bankrupt the system – and ultimately the nation. According to the Medicare trustees, without substantial changes, the Medicare program will collapse in 2024. This budget saves Medicare by fixing flaws in its structure so it will be there for future generations. By putting these solutions in place now, this budget ensures that changes will not affect those in and near retirement in any way. No changes will be made to Medicare for anyone 55 and older. When younger workers become eligible for Medicare a decade or more from today, they will be able to choose from a list of guaranteed coverage options, including traditional Medicare. This flexibility will allow seniors to enjoy the same kinds of choices in their plans that members of Congress and federal employees enjoy. Starting in 2023, Medicare will provide a payment to subsidize the cost of the plan, which seniors can then use to pick either private health insurance or a federal plan modeled after Medicare. By forcing plans to compete against each other to serve the patient, the government will help ensure the best medical program for the dollar. It will therefore guarantee affordability. In addition, Medicare will provide increased assistance to lower-income beneficiaries and to those with greater health risks. Plans will not be able to “cherry pick” beneficiaries or deny coverage to those with pre-existing conditions. And there will be a strengthened safety net for the poor and sick. This essential reform offers one of the benefits of Obamacare (no denial because of pre-existing conditions) yet empowers individuals to make healthcare decisions based on their own situation. It will guarantee that Medicare can fulfill the promise of health and security for America’s seniors. In contrast, President Obama’s health care law takes $500 billion from the Medicare Trust Fund to pay for the costs of his new health care entitlement. With no serious plan to save and preserve Medicare for current and future seniors, the President would allow parts of Medicare to go bankrupt in 2024. The President’s law also empowers a board of unelected bureaucrats, known as the Independent Payment Advisory Board, or IPAB, to cut Medicare through formulaic rationing and determine what services your doctor and hospital can and cannot give you, hurting both Medicare recipients and health care providers. Conversely, Ryan’s budget plan ends the raid on the Medicare Trust Fund by repealing the President’s health care law, including IPAB, and ensures that any potential savings in current law would go to help Medicare, not to pay for new entitlements. In addition to repealing the health care law’s new rationing board and its unfunded long-term care entitlement, the budget stabilizes plan choices for current seniors. This budget also calls for action on Social Security by requiring both the President and the Congress to put forward specific ideas and legislation to ensure the sustainable solvency of this critical program. The risk to Social Security, driven by demographic changes – namely 10,000 baby boomers retiring every day – is nearer at hand than most acknowledge. According to the 2011 Social Security Trustees Report, beneficiaries will face a painful 23% benefit cut in 2036 when the Social Security Trust fund is exhausted. Both parties must work together to chart a path forward on common-sense reforms, and this budget provides the nation’s leaders with the tools to get there. (4). Pro-Growth Tax Reform. The current tax code for individuals is too complicated, with high marginal rates that discourage hard work and entrepreneurship. Ryan’s plan embraces the widely acknowledged principles of pro-growth tax reform by proposing to consolidate tax brackets and lower tax rates, to just two rates of 10% and 25%, while clearing out the burdensome tangle of loopholes that distort economic activity and primarily benefit the wealthiest Americans. American businesses are also overburdened by the highest corporate income tax rates in the developed world. The perverse incentives created by the corporate income tax do a lot of damage to both workers and investors, yet the tax itself raises relatively little revenue. Ryan’s budget improves incentives for job creators to work, invest, and innovate in the United States by lowering the corporate rate from 35% (the highest in the industrialized world) to a much more competitive 25% (the international average) and by shifting to a territorial system that will ensure a level playing field for American businesses. It is also important to remember that most small businesses file their taxes as individuals, and not as corporations. Ryan notes that 9 out of 10 small businesses in Wisconsin file their taxes as individuals. These small businesses, known as “sub-chapter S corporations,” limited liability corporations (LLCs), and partnerships, employ more than half of all private sector workers. The President is proposing that the top tax rate for these businesses be raised to 45% in January of 2013. With two thirds of the net new jobs in America being created by small businesses, the President’s tax proposal is a plan to kill job creation. Some of our foreign competitors are lowering their tax rates on businesses to as low as 15%. As noted above, our budget lowers the top individual tax rate to a more competitive 25% while broadening the tax base by eliminating loopholes and tax shelters. (5). Providing for the Common Defense. With American men and women in uniform currently engaged with a fierce enemy and dealing with emerging threats around the world, Ryan’s budget takes several steps to ensure that national security remains government’s top priority. It rejects proposals to make thoughtless, across-the-board cuts in funding for national defense. Instead, it provides $554 billion for national defense spending, an amount that is consistent with America’s military goals and strategies. The budget preserves necessary defense spending to protect vital national interests today and ensures future real growth in defense spending to modernize the armed forces for the challenges of tomorrow. The defense budget is slated to be cut by $55 billion, or 10%, in January of 2013 through the sequester mechanism enacted as part of the Budget Control Act of 2011. This reduction would be in addition to the $487 billion in cuts over ten years proposed in President Obama’s budget. The President’s proposal for defense spending represents a budget-driven strategy, not a strategy-driven budget. Ryan’s budget eliminates these additional cuts in the defense budget by replacing them with other spending reductions. Spending restraint is critical, and defense spending needs to be executed with effectiveness and accountability. But government should take care to ensure that spending is prioritized according to the nation’s needs, not treated indiscriminately when it comes to making cuts. The nation has no higher priority than safeguarding the safety and liberty of its citizens from threats at home and abroad. The Ryan budget plan also honors the brave soldiers, sailors, airmen, and marines who have served our country and made tremendous sacrifices on behalf of this nation. Not only does it match the President’s FY2013 request for $61.34 billion to spend on veterans, it calls for more than $16.6 billion in additional spending on veterans and their families over the next ten years. As a country, we must remember the sacrifices of our veterans and their families, who have bravely served our nation, and this budget proves committed to providing the best care possible for them and uniformed service members. Not exactly a “radical” and “extreme” plan, as President Obama accused it of being. [After reading what Paul Ryan’s plan provides, you will notice that there are several advertisements – “approved by President Obama” – which appear not to be truthful]. The budget that Rep. Paul Ryan wrote came up for a vote before the House on March 29 and was passed by a margin of 228 – 191. Americans were encouraged that the House again voted in favor of a Paul Ryan budget plan instead of continuing down the path of debt, doubt, and decline. Before voting to pass this budget proposal, the House had the opportunity to vote on President Obama’s budget proposal for FY2013. The House unanimously rejected the President’s proposal, by a vote of 0 – 414, a clear indication that Republicans and Democrats alike did not believe the President put forth a credible plan to address America’s challenges. The economy is the number one issue in this upcoming election. People want jobs. Fathers and mothers want to earn a living for their family. They want the dignity that comes with earned success and not the indignation that comes from accepting a hand-out without producing anything or offering a service in return. Our elderly and disabled want to know that our economy is strong enough to protect the programs on which they depend. Businesses want to trust that the government supports their efforts to invest and grown their operations and create jobs and not punish them for taking risks or for their success. Is it reasonable that small businesses must incur the debt and provide their female employees contraceptives so they can live a sexually-free lifestyle? Is that the role of a business owner? We all secretly, or openly, are looking for certain promises from the Republicans at their convention this week. For those disillusioned Democrats, they want to know that if they take the chance and vote against their party, they will not be worse off in the next 4 years. Independents, who have been frustrated with both parties, have to hear something from Mitt Romney and Paul Ryan that affirm their faith in American and not add to their distrust of government. And Republicans want to be inspired so they can organize their communities as they’ve never been able to do before. To defeat Obama, the Romney-Ryan duo must contrast our great Legacy of Liberty with the oppressive socialist doctrines advocated by the Left. They must energize the largest conservative grassroots movement in history and enlist the support of American Patriots from all walks of life. They must alert fellow countrymen that we are on the downside of the fatal cycle of human liberty and the only way to turn things around is by restoring constitutional integrity and governance. We see the same themes and issues that Ronald Reagan highlighted when he ran for the presidency in 1980. Under Jimmy Carter, Americans were suffering from out-of-control social programs, a recession, inflation, high unemployment, deficit spending, and runaway taxes. He asked the country if they were better off than they were 4 years earlier. He asked the people if they believe that a small, political elite in Washington can plan their lives for them better than they can. He urged a return to the timeless government principles our Founding Fathers wanted for us. Mitt Romney needs to do the same thing. Unlike Reagan, Romney is not necessarily a great speaker. But that shouldn’t stop him from talking about great things and great ideas. Like Reagan did. The election of 1980, an election poised on the choice to the American people of opposing government ideology, was not unlike the election we face in November. Extreme government control with limited freedom OR limited government with extreme freedom !! At several events and fundraisers (2011 and 2012), President Obama attempted to compare himself to Reagan. Not to cheapen a good line, but I voted for Ronald Reagan in 1980, and Barack Obama is no Ronald Reagan. “I want my candidacy to unify our country; to renew the American spirit and sense of purpose. I want to carry our message to every American, regardless of party affiliation, who is a member of this community of shared values…… Never before in our history have Americans been called upon to face three grave threats to our very existence, any one of which could destroy us. We face a disintegrating economy, a weakened defense and an energy policy based on the sharing of scarcity. The major issue of this campaign is the direct political, personal and moral responsibility of Democratic Party leadership – in the White House and in Congress – for this unprecedented calamity, which has befallen us. They expect you to tell your children that America has had her day in the sun and that the future will be one of sacrifice and few opportunities. We need a rebirth of the American tradition of leadership at every level of government and in private life as well. Back in 1976, Mr. Carter said, ‘Trust me.’ And a lot of people did. Now, many of those people are out of work. Many have seen their savings eaten away by inflation. Many others on fixed incomes, especially the elderly, have watched helplessly as the cruel tax of inflation wasted away their purchasing power. ‘Trust me’ government asks that we concentrate our hopes and dreams on one man; that we trust him to do what’s best for us. My view of government places trust not in one person or one party, but in those values that transcend persons and parties. The trust is where it belongs – in the people. The responsibility to live up to that trust is where it belongs, in their elected leaders. That kind of relationship, between the people and their elected leaders, is a special kind of compact. Three hundred and sixty years ago, in 1620, a group of families dared to cross a mighty ocean to build a future for themselves in a new world. When they arrived at Plymouth, Massachusetts, they formed what they called a ‘compact’; an agreement among themselves to build a community and abide by its laws. This single act – the voluntary binding together of free people to live under the law – set the pattern for what was to come. A century and a half later, the descendants of those people pledged their lives, their fortunes and their sacred honor to found this nation. Some forfeited their fortunes and their lives; none sacrificed honor. Isn’t it once again time to renew our compact of freedom; to pledge to each other all that is best in our lives, for the sake of this, our beloved and blessed land? We must overcome something the present administration has cooked up: a new and altogether indigestible economic stew, one part inflation, one part high unemployment, one part recession, one part runaway taxes, one party deficit spending and seasoned by an energy crisis. It’s an economic stew that has turned the national stomach. Ours are not problems of abstract economic theory. Those are problems of flesh and blood; problems that cause pain and destroy the moral fiber of real people who should not suffer the further indignity of being told by the government that it is all somehow their fault. I believe the American people are going to answer these questions the first week of November and their answer will be, ‘No! We’ve had enough.’ And, then it will be up to us, beginning next January 20th, to offer an administration and congressional leadership of competence and more than a little courage. We must have the clarity of vision to see the difference between what is essential and what is merely desirable, and then the courage to bring our government back under control and make it acceptable to the people. I believe it is clear our federal government is overgrown and overweight. Indeed, it is time for our government to go on a diet. Therefore, my first act as chief executive will be to impose an immediate and thorough freeze on federal hiring. Then, we are going to enlist the very best minds from business, labor and whatever quarter to conduct a detailed review of every department, bureau and agency that lives by federal appropriations. We are also going to enlist the help and ideas of many dedicated and hard working government employees at all levels who want a more efficient government as much as the rest of us do. I know that many are demoralized by the confusion and waste they confront in their work as a result of failed and failing policies. Our instructions to the groups we enlist will be simple and direct. We will remind them that government programs exist at the sufferance of the American taxpayer and are paid for with money earned by working men and women. Any program that represents a waste of their money — a theft from their pocketbooks–must have that waste eliminated or the program must go — by executive order where possible; by congressional action where necessary. Everything that can be run more effectively by state and local government we shall turn over to state and local government, along with the funding sources to pay for it. We are going to put an end to the money merry-go-round where our money becomes Washington’s money, to be spent by the states and cities exactly the way the federal bureaucrats tell them to. I will not accept the excuse that the federal government has grown so big and powerful that it is beyond the control of any president, any administration or Congress. We are going to put an end to the notion that the American taxpayer exists to fund the federal government. The federal government exists to serve the American people. On January 20th, we are going to re-establish that truth. Also on that date we are going to initiate action to get substantial relief for our taxpaying citizens and action to put people back to work. None of this will be based on any new form of monetary tinkering or fiscal sleight-of-hand. We will simply apply to government the common sense we all use in our daily lives. Work and family are at the center of our lives; the foundation of our dignity as a free people. When we deprive people of what they have earned, or take away their jobs, we destroy their dignity and undermine their families. We cannot support our families unless there are jobs; and we cannot have jobs unless people have both money to invest and the faith to invest it. There are concepts that stem from an economic system that for more than 200 years has helped us master a continent, create a previously undreamed of prosperity for our people and has fed millions of others around the globe. That system will continue to serve us in the future if our government will stop ignoring the basic values on which it was built and stop betraying the trust and good will of the American workers who keep it going. The American people are carrying the heaviest peacetime tax burden in our nation’s history – and it will grow even heavier, under present law, next January. We are taxing ourselves into economic exhaustion and stagnation, crushing our ability and incentive to save, invest and produce. This must stop. We must halt this fiscal self-destruction and restore sanity to our economic system. I have long advocated a 30% reduction in income tax rates over a period of three years. This phased tax reduction would begin with a 10% ‘down payment’ tax cut in 1981, which the Republicans and Congress and I have already proposed. A phased reduction of tax rates would go a long way toward easing the heavy burden on the American people. But, we should not stop here. Within the context of economic conditions and appropriate budget priorities during each fiscal year of my presidency, I would strive to go further. This would include improvement in business depreciation taxes so we can stimulate investment in order to get plants and equipment replaced, put more Americans back to work and put our nation back on the road to being competitive in world commerce. We will also work to reduce the cost of government as a percentage of our gross national product. The first task of national leadership is to set honest and realistic priorities in our policies and our budget and I pledge that my administration will do that. The present administration has been forced by us Republicans to play follow-the-leader with regard to a tax cut. But, in this election year we must take with the proverbial ‘grain of salt’ any tax cut proposed by those who have given us the greatest tax increase in our history. When those in leadership give us tax increases and tell us we must also do with less, have they thought about those who have always had less – especially the minorities? This is like telling them that just as they step on the first rung of the ladder of opportunity, the ladder is being pulled out from under them. That may be the Democratic leadership’s message to the minorities, but it won’t be ours. Our message will be: we have to move ahead, but we’re not going to leave anyone behind. Thanks to the economic policies of the Democratic Party, millions of Americans find themselves out of work. Millions more have never even had a fair chance to learn new skills, hold a decent job, or secure for themselves and their families a share in the prosperity of this nation. It is time to put America back to work; to make our cities and towns resound with the confident voices of men and women of all races, nationalities and faiths bringing home to their families a decent paycheck they can cash for honest money. When we cast our eyes abroad, we see an equally sorry chapter on the record of the present administration. We are not a warlike people. Quite the opposite. We always seek to live in peace. We resort to force infrequently and with great reluctance – and only after we have determined that it is absolutely necessary. We are awed–and rightly so – by the forces of destruction at loose in the world in this nuclear era. But neither can we be naive or foolish. Four times in my lifetime America has gone to war, bleeding the lives of its young men into the sands of beachheads, the fields of Europe and the jungles and rice paddies of Asia. We know only too well that war comes not when the forces of freedom are strong, but when they are weak. It is then that tyrants are tempted. We simply cannot learn these lessons the hard way again without risking our destruction. Of all the objectives we seek, first and foremost is the establishment of lasting world peace. We must always stand ready to negotiate in good faith, ready to pursue any reasonable avenue that holds forth the promise of lessening tensions and furthering the prospects of peace. But let our friends and those who may wish us ill take note: the United States has an obligation to its citizens and to the people of the world never to let those who would destroy freedom dictate the future course of human life on this planet. I would regard my election as proof that we have renewed our resolve to preserve world peace and freedom. This nation will once again be strong enough to do that. It is impossible to capture in words the splendor of this vast continent which God has granted as our portion of this creation. There are no words to express the extraordinary strength and character of this breed of people we call Americans. Nearly 150 years after Tom Paine wrote those words, an American president told the generation of the Great Depression that it had a ‘rendezvous with destiny.’ I believe that this generation of Americans today has a rendezvous with destiny. Tonight, let us dedicate ourselves to renewing the American compact. I ask you not simply to ‘Trust me,’ but to trust your values–our values–and to hold me responsible for living up to them. I ask you to trust that American spirit which knows no ethnic, religious, social, political, regional, or economic boundaries; the spirit that burned with zeal in the hearts of millions of immigrants from every corner of the Earth who came here in search of freedom. Isn’t this the same message we want to hear again, in 2012? As conservatives? As independents? As disillusioned and demoralized Democrats? As Tea Partiers? As Americans? Isn’t this the message we need to hear? With the economy in shambles as it is and with our national debt mounting as quickly as it is, and with the only response Obama offers is more blame, division, and class warfare, don’t we need bold solutions like Reagan offered? We already know that Paul Ryan’s budget plan includes a tax restructuring reform like the Gipper implemented. And we know his plan puts us on a path that will rescue the debt from our children and will relieve us from the need to increase taxes. Our social programs will be safe. The lesson of 1980 is this: Out of severe inflation, economic depression, joblessness, and high taxes came an era of extreme prosperity. It was possible simply by the exchange of policies – the former centered around government and the latter centered around the individual. Romney and Ryan must make Americans truly see that they are not better off today than they were 4 years ago. And then they must follow it up with a bold free-enterprise plan for economic recovery. Ryan has to explain his Path to Prosperity plan in a way that Americans can understand it. They must boost American morale, and continue to speak forcibly about Obama’s failed socialist regime. They must touch the patriotic core in all of us and ask if we truly want to transform this great land of ours, as Obama is committed in doing, or restore it to its intended glory. They must remind Americans what Obama told a crowd at Georgetown University in April 2009 when he talked about his new ‘foundation’ and the task he faced of re-building this country, according to the policies that his administration designed. He used such words as “reform” and “transform.” He talked about needing “new legal authority” to make the changes necessary. He said that the Reagan model (that is, of limited government) was not a sustainable model for long-term prosperity” and needed to be abandoned. Romney needs to condemn this idea that a President needs “new constitutional powers.” to do so. The election has to be about liberty. It can’t be about temporary solutions. It has to be about reapplying our founding principles and restoring a culture of liberty. With a message like that, I have optimism that the Romney-Ryan ticket will deliver a message as important and bold as the message Ronald Reagan delivered in 1980. The Republican National Convention just might be exciting after all… and perhaps historic as well. Excellent, hopeful post! … Romney’s selection of Paul Ryan as his running mate has invigorated those of us who seek to restore the republic by electing leaders who value our fundamental principles and propose policies that have already been demonstrated to work. I pray that in November we have sufficient numbers who recognize the contrast at some level in their lives and say ‘No’ to the current slide to tyranny. Then it’s time to stand behind those new leaders to give them the courage and support to change course and begin the hard work to rebuild our sovereign nation. As I sit here this morning, listening to NPR in the background, one of the first things we should consider for the first100 days is pulling the plug on all of the federal dollars (i.e. our money) we spend to as you say, “wash our own brains”. Free speech is fine, on their own dime. Thanks for the great post!